Are you an avid reader of lesbian fiction or WLW books and want to make 2018 a little more interesting? 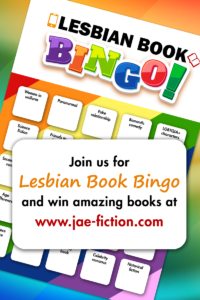 Then you might want to check out Jae’s Lesbian Book Bingo. It’s a big, year-long event, with many authors and publishers—including Ylva—donating books for giveaways. You can win amazing books all year long—just by reading! Any novel set during the summer months or in an exotic location, e.g., an island. Jae used to work as a psychologist but gave up her day job in 2013 to become a full-time writer and a part-time editor. For the past ten years she has been writing mostly in English.